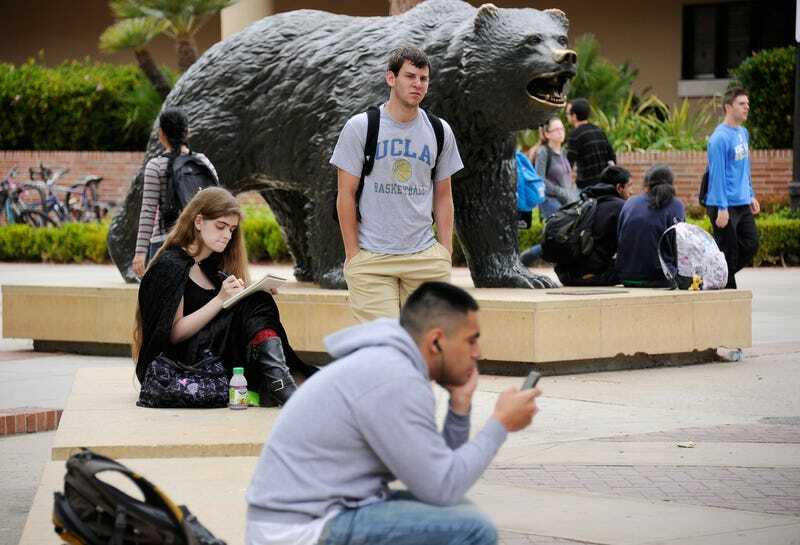 Students sit around the Bruin Bear statue during lunchtime on the campus of UCLA on April 23, 2012, in Los Angeles. Fliers posted around UCLA promoting a "white students" group have been removed, officials confirmed Wednesday, the Los Angeles Times reports. According to the report, UCLA maintenance workers found three or four of the fliers taped to buildings on Monday. Listed on the fliers were a website, a Twitter account and an email address for more information. School officials, however, say that the group does not exist. UCLA spokesperson Tod Tamberg said that none of the groups listed were affiliated with the university and the school did not have a white-students group. “As [UCLA] Chancellor [Gene] Block and President [Janet] Napolitano affirmed in their statement last week, UCLA and the UC are proud of our diversity and remain committed to supporting all members of our community and adhering to UC's Principles Against Intolerance,” Tamberg said. “Divisive and racist language do not reflect the ideals that we set for ourselves on this campus. UCLA defends First Amendment rights and strongly encourages all members of our community to be respectful of one another as they engage in honest dialogue and debate." According to the Times, campus police are not investigating the incident because no crime was committed.